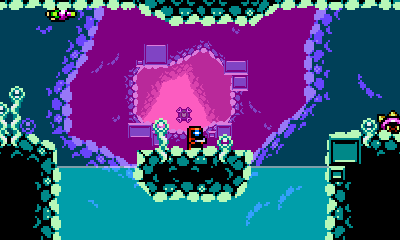 Xeodrifter is a particularly intriguing 3DS eShop title from Renegade Kid. Due to some delays and struggles in 2014 the popular studio took a decision to turn around this passion project for 3DS in just five months, and the resulting Metroidvania retro-styled experience proved to be a critical success. It's a testament to what can be achieved by dedicated developers keen to share a new game, with the studio's co-founder Jools Watsham saying the following to us last year. It was a real shotgun project in terms of focus, speed, and effort. It was definitely a labour of love; we could not have completed it without that passion and desire to create something special. It's only been released in North America, so far, with the title yet to reach PAL regions. The good news is that Renegade Kid has told Nintendo Life that it's now confident of an 18th June release in Europe, Australia and New Zealand - it's not 100% for that date, but it's looking likely. In addition pricing will be set at €8.99 / £7.99, which matches up with the equivalent $9.99 eShop price in North America. Are any of you PAL gamers planning to dive into this download treat over the summer months? Finally! First day buy for me. "That includes you Australia / New Zealand"
i dunno, the article may have changed since you posted, but it states ,,in Europe'', so Germany as well. @KeeperBvK It's coming to Europe as a whole. It looks so great but isn't it quite short... So the price is slightly more than I'd like to pay but we'll see. The game is fantastic if you like Metroid type games. Rather short, but excellent while it lasts. Yay! Definitely buying this cutie. One of the best game for the 3ds! Spot on. Just after pay-day! I still need to pick this game up myself! I've loved the look of it from the very beginning! As an American who semi-recently bought the game myself, I can say that you guys are in for a real treat! @Legromancer "In Europe" doesn't necessarily mean "in all of Europe". Indie developers have complained about the high rating costs for Germany and already quite a few games have not been released in Germany without any remark on that matter. They were said to be released in Europe and they in fact were released in Europe. Just not in all of Europe; not in Germany. And a developer would probably never spoil their own announcement by publishing a news like "We're glad to tell you that our game XYZ is soon going to hit Europe! But not for you Germans. Sorry 'bout that.". They'd just keep silent on the matter. @ThomasBW84 Has that really been confirmed? Glad to hear that then.